After getting married and spending time in the marshes of South Jersey and Delaware with her husband Raymond, suburban born Janice Chassier discovered a whole new world; one alive with layers of life and the tidal marsh that was filled with life changing drastically from dawn to dark. Maintaining balance in life-which is filled with continued change-is a constant challenge. Children, adolescents, adults: each stage of life has obstacles to overcome and physical and emotional effects to endure. Obstacles in life shape people into who they are and overcoming these obstacles allows people to change their possible destiny. Her waterfowl series represent change with the stages of life. Janice admires the values of our past generations and sees geese with similar qualities. The geese personify people in different stages of life. While it is important to her that their bodies are sculpted realistically, their bodies are her canvas. 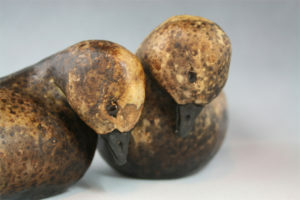 They have a distinctive surface treatment that reflects how life has affected them. The Obvara firing technique was chosen as it is symbolic of life. After carefully sculpting the waterfowl Janice then subjects them to extreme temperature changes, firing them to 1000 degrees and then submerging them into a bath of room temperature water mixed with yeast and flour. The severe temperature difference leaves distinct, unique marks. Just as the bath determines the look of the goose, the events and people in our lives shape who we become. Some become beautiful; life has been good. When life is difficult, the surface can be harsh or it may break the individual. These scars are an important part of who they are. Her newest work includes making cairns. For Chassier they are spiritual reminders; reminding us of the importance of balance, marking where we are going, and celebrating times and places that we have spent with people. Janice’s functional work is usually decorated with at least one leaf or resembles trees and branches. As a gardener, she loves when the first leaves are ready to turn and face the sun, to face the world. At this stage Janice believes that all leaves are about the same, but like children with care, nourishment and time they grow and develop into healthy individuals. Sometimes like people, some of these plants need to “hang on” to others for support. Twisting tendrils help the plants to hang on and provide us with food and seeds for the next generation.If the seed happens to be that of a tree, the outer surface changes in time; like the aging process changes our bodies. The bark becomes highly textured or wrinkled, the tree gets larger, the colors change, and sometimes the “heart” wood gets damaged. But even though the tree has changed, it is strong. It is always giving, providing food, shade, shelter and the air that we breathe. While Janice discovered a love of ceramics as a child, it was after raising her two daughters that she took the journey back to clay. Receiving a Masters of Studio Arts from Hood College in Frederick, Maryland has honed her artistic ceramic skills. Nature and family inspire Janice Chassier.